ZipCloud is an online backup service that allows you to store your files in the cloud and sync them across multiple devices that you own. This service specializes in simplicity while promoting the security of your data. One of the most appealing parts of ZipCloud is the pricing which, depending on the prepay you select can be as low as $4.49 per month. Thankfully, with our review, you’ll know exactly what you are getting yourself into with our full price comparison show below. We found ZipCloud very easy to use to transfer files from desktop to mobile using the software/apps they provide. The help center provides 10 videos to help get your started along with a large library of help documentation. In order to discover pricing and included plan features, you have to setup an account or leave their site and Google search which is inconvenient. The free account provided by ZipCloud is severely limited to 15MB before it asks for an upgrade to a premium plan. Once you sign up to ZipCloud, you will be presented with a small banner at the top of the screen which will take you to a screen similar to the one shown below which offers various plans to choose from. Based on our comparison of pricing from various resources and their website, we are assuming the 20% discount offered is always available. All three non-business plans offers the same features across the board. The main difference is the storage space that is made available. Home Plan: This plan offers 75GB of online storage. Premium Plan: This plan offers 250GB of online storage. Unlimited Plan: This plan offers unlimited online storage. One of the biggest frustrations we have with ZipCloud is they do not mention the actual price you will be paying. They mention the monthly price, the term, but not the final price which should be included, especially on the page that also takes your payment details. We made every effort to calculate the true cost above, however, if you choose to go with ZipCloud, make your selection carefully. The pricing above is based on a 20% discount for new customers. After renewal, you should expect to pay their full price, therefore, if you like their service, choose a larger prepay plan to save money. 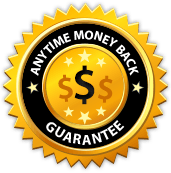 ZipCloud offers an impressive anytime money back guarantee that states, if you select a prepay plan and decide the service is not for you, you can request the money back on the remainder of your current payment term. With exception to the monthly payment plan, there is an early termination fee of $14.95 to terminate your plan early which is taken out before your refund is processed. This guarantee is only based on the storage plans and does not include any upgrades you pay for, which is something you should keep in mind. 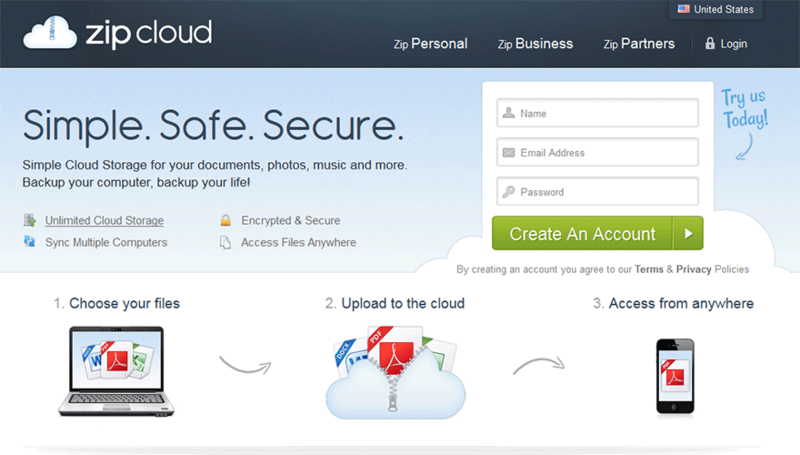 We found ZipCloud to be a storage locker type of backup service. The Windows application will allow you to select various files that you want to maintain a backup of, but if you need to recover from a disaster like your Windows machine not booting, you won’t be able to recover with ZipCloud. 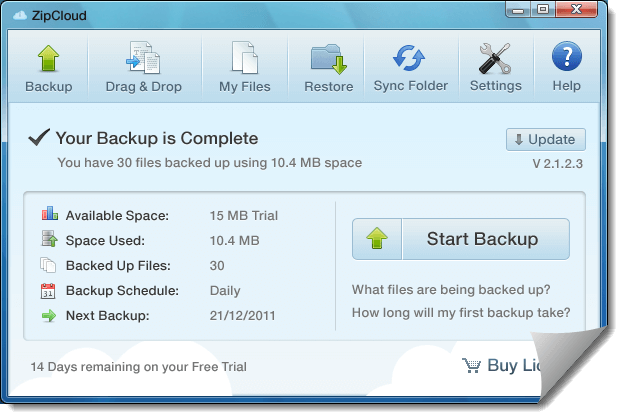 Instead, take a look at Acronis True Image for a full PC/Mac backup solution. Encryption: ZipCloud maintains a 256-bit security on your files from the point they leave your computer to the online storage provided. Platforms: Windows, Mac, Linux, iPhone, iPad, Android, Blackberry and Kindle Fire. Should you need to access the website on a device that doesn’t have a compatible app, you can use their mobile-optimized website which we confirmed work well. File Versioning: You will be able to set up automatic backups of specific folders and this service will store multiple versions of the same file for easy recovery. Backup Modes: They offer scheduled backups, selective file backups, idle backups (when computer is not in use). File Sharing: Share your files across all of your devices. 24/7 Support: Gain access to phone, email support along with video tutorials that show you how to use the service. We found ZipCloud to be a basic online backup service that has an awesome entry-level pricing along with an easy to use interface to store your files on the cloud. After signing up, we found their email campaigns to be very aggressive in attempt to get you to upgrade to a premium plan. Actual restoration of files was easiest using the included software but can also be done on their website once you authenticate and login. Transfers were quick and easy with an average 3MB file taking approximately 5 seconds to transfer to the desktop on a fast Internet connection. Downloading a file on mobile was also easy to do. Install the app for Android or Apple and then provide your username and password. From there, you’ll be given a list of files stored where you can then download the files to your mobile device, whether it be a smartphone or tablet. We found transferring music from our PC desktop to Android to be easier than transferring the files manually with a USB cable. Are your using ZipCloud? Leave a review in the comment section below and let our readers know how your experience has been so far.